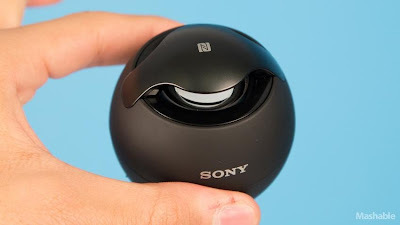 I'm kind of in love with Sony's little egg-shaped speaker, the SRS-BTV5. The tiny, tennis-ball-sized gadget is so cute, it really deserves a name other than the seemingly random series of characters. Maybe Veronica. It looks like a Veronica. At least mine does, but that's probably because it's raven colored. I really wanted one of the bright pink ones — it just seems to go better with the spherical shape — but black still makes a statement, if a quieter one. And by quiet, I'm referring to the design, of course — not the sound. Veronica actually plays fairly loud for a tiny ball. She's not going to sustain a house party, but a hotel room, definitely. Part of a growing trend among accessories, Sony's egg is equipped with NFC (near-field communication) for instant pairing with any NFC phone. That includes almost all top-line Android models, including Sony's as well as franchise players such as the Samsung Galaxy S4 and HTC One, but not the iPhone. To pair, just enable NFC through the phone's settings and hold it over the top "bridge" over the driver, where the NFC tag sits. This will immediately links the phone with the speaker via Bluetooth. Those without NFC phones can fall back to the plain old Bluetooth pairing, which is hardly cumbersome, but still complicated enough that it prevents many from ever using it. There's also a mini-jack input for a hard-wire connection. I had some trouble pairing Veronica with my iPhone 4S via Bluetooth (I kept seeing "ubuntu-0" appear as the speaker's name in my Bluetooth device list, which never paired), so I switched to an HTC One with NFC. A few seconds later, I was rocking out to Pandora on the Sony. I listened to various types of music — from the slow, airy notes of the soundtrack to Chocolat to the rough-and-tumble Three Days of Grace's "Animal I Have Become" — and Veronica performed extremely well. That is, except when I turned the volume all the way up. At maximum volume, her sound started to break up with distortion, so I kept things a couple notches down for the rest of my listening (side note: volume controls aren't integrated, which is a tad disappointing). That was still loud enough to fill a conference room with good sound. Comparing the Sony's performance with that of the little Jambox, Veronica held her own. She couldn't match the Jambox's volume, but her small 360-degree driver gave a little extra oomph to the midrange. Overall, though, the Jambox won. Still, not bad for $69.99 (the li'l Jambox is $179.99). My favorite Bluetooth speaker right now is still the UE Boom, but for something a little more portable, pairable and — let's face it — pretty, Veronica ... er, the Sony SRS-BTV5, is a great cheap date for a casual night out.